Muslims travel tips in korea is a blog that contains various information for muslim traveler especially about mosque and prayer room and places to get halal food and snacks in south korea. 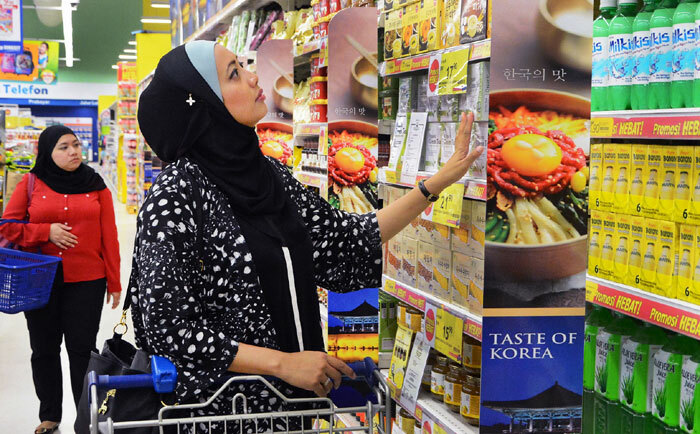 Muslim travel tip in korea adalah blog yang berisi tentang tempat sholat, dimana dapat membeli makanan ringan dan berbelanja halal, dan dimana bisa menemukan restoran halal di Korea. The restaurant which has not received halal logo/certificate but do not sell products that contains haram ingredients or food that contains pork or alcohol (I would include “edible” in front of the article). Rumah makan yang belum mendapatkan logo halal tetapi tidak menjual produk berbahan haram (menjual makanan berbahan dasar babi) (saya akan mencantumkan “bisa dimakan” di depan artikel). We also give you information about prayer room in some attraction places, so you do not have to worry about where you will do prayer (salah). Di Muslim travel tip in korea anda bisa mendapatkan informasi tentang dimana tempat sholat dan makan yang halal di tempat-tempat wisata terkenal di Korea. So if you come to korea feel not afraid about food and prayer, you just open our website and you can find all about information what you want. Sehingga ketika anda melakukan perjalanan ke Korea tidak perlu khawatir tentang apa yang akan anda makan dan dimana anda akan beribadah. Cukup dengan masuk blog kita dan dapatkan informasi-informasinya. Click out our Google Maps!! Seoul Central Mosque area, we can find many halal food restaurant and one of them is Pasha Turkish Food & Kebab in Seoul Central Mosque area. This restaurant sells kebabs (beef, chicken and mixed kebab), you can choose kebab you want to try but i recommend you to try mixed kebab that contain beef and chicken and the price is not too expensive. If you feel bored with vegetarian korean food or middle east asian food, you can try different taste of south east asian food here, we recomend you to try Indonesian or Malaysian food because it’s their speciality. Go Sam I (고삼이) is a restaurant that only sells seafood. You can find varies seafood like swordfish, mackerel and squid that can be fried, roasted or grilled. in addition you can enjoy Korean food too but only Sundubu jigae (spicy tofu stew), dwenjang jigae, and of course, kimchi jigae. Bombay girl is a restaurant that serves Indian specialties. This particular restaurant provides a menu of typical Indian food. Cury as typical Indian food is also served in several flavors so you can get the real taste of typical indian food. Zaffran is one restaurant that provides arabian and indian food on their menu. The price of food in the restaurant was also varied from 3,000 to 15,000. In this restaurant you can try chicken bath, hot garlic shirmp, Dates mutton curry, etc. Seoul Central Mosque or commonly known as Seoul’s mosque is the first mosque built in Korea. Was built in 1974, and started operating since 2 May 1976. This mosque was built with three floors, the first floor is meeting room and office, second floor is male prayer hall and 3rd floor is female prayer hall. There are only stairs to reach the desired floor. Ansan Sirothol Mustaqim Mosque was inaugurated on November 24, 2013. This mosque consists of 4 floors. The first floor used as a Imam’s room, Halal shop and a parking lot, to the second floor used as the main prayer hall, the third floor used for ahwat and fourth floors used exclusively for Indonesian pilgrims. Mini market selling all household purposes, ranging from spices and meats. You also can find halal meat sold there, so you no need to worry. Besides herbs and meat there is also vegetables. The most important thing there you will find halal snacks from some countries. National foods mart is a mini market which sells halal snacks in korea. This mini market is not much different with the foreign mart. Only in the national foods mart they do not sell vegetables and meats. They only sell imported snacks from different countries. This entry was posted in Muslim Travel Guide and tagged islam, muslim, tips, tour, trip. Meet Angel-in-us’ delicious drink, the Americcino!